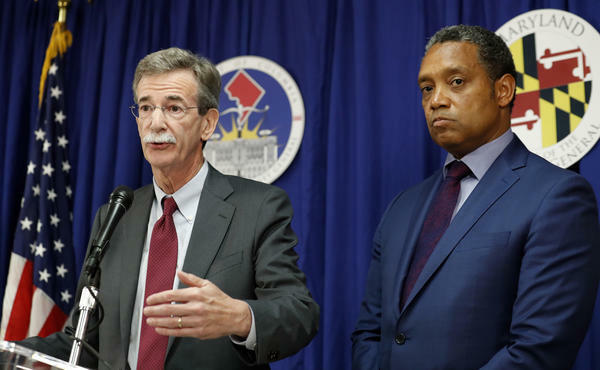 Maryland Attorney General Brian Frosh (left) and District of Columbia Attorney General Karl Racine announce a lawsuit against President Trump over conflicts of interest with his businesses on Monday in Washington. Can states force President Trump to sell off his businesses? That question is being raised by a new legal challenge to Trump's continued ownership of far-flung businesses. On Monday, the attorneys general for Maryland and the District of Columbia filed a lawsuit in a Maryland federal court, saying that Trump's failure to sell off his interests in hotels, golf courses, office buildings and other properties is undermining public trust and violating the U.S. Constitution's Emoluments Clause. "President Trump's continued ownership interest in a global business empire, which renders him deeply enmeshed with a legion of foreign and domestic government actors, violates the Constitution and calls into question the rule of law and the integrity of the country's political system," the lawsuit charges. A similar suit was filed in a New York federal court in January by Citizens for Responsibility and Ethics in Washington, or CREW, a public-interest group. On Friday, the Trump administration's Justice Department responded, saying the case should be dismissed because the plaintiffs lack the legal standing to sue. The court will have to decide that in coming months. On Monday, White House press secretary Sean Spicer was asked about the new state-backed lawsuit. He replied that Trump's business interests "do not violate the Emoluments Clause," for reasons spelled out by the Justice Department's filing on Friday. This new suit was brought by attorneys general who are both Democrats, Spicer noted. "It's not hard to conclude that partisan politics may be one of the motivations" for filing suit, Spicer said. "We'll continue to move to dismiss this case in the normal course of business," he added. But the latest suit may make a stronger case than CREW's because the plaintiffs are D.C. Attorney General Karl Racine and Maryland Attorney General Brian Frosh. Racine and Frosh said in a news conference that the Trump hotel, just blocks from the White House, creates unfair competition for other businesses in the District and Maryland. For example, the Trump property competes against Washington's convention center; a government-owned conference center in Bethesda, Md. ; and the National Harbor resort in Prince George's County, Md. Lobbyists, foreign diplomats and others who might wish to curry favor with Trump have been frequenting the Trump hotel, which is unfair, the argument goes. "It's unprecedented that the American people must question day after day whether decisions are made or actions are taken to benefit the United States or to benefit President Trump," Frosh said. Lawrence Noble, senior director and general counsel of the Campaign Legal Center, told NPR the two attorneys general are "saying that they're being adversely affected by the president's violation of the Emoluments Clause, and they make a very strong argument that financially, they're being affected." The attorneys general accused the president of violating the Constitution's clause that blocks federal officials from accepting gifts, or emoluments, from foreign governments. The Constitution also bars a president from accepting economic benefits from federal or state governments, other than a basic salary. Since Trump continues to own and profit from the Trump Organization, the lawsuit claims citizens cannot know whether their president is making decisions in the best interests of the nation or rather out of "self-interested motivations grounded in the international and domestic business dealings in which President Trump's personal fortune is at stake." Trump has stepped back from daily management of his businesses, which have been placed into a trust run by his sons and another close associate. But he remains the sole beneficiary of the trust. His son Eric has said the president will continue to get updates on profits.